Woodfield is a school for pupils aged 3-19 with severe and complex learning difficulties. 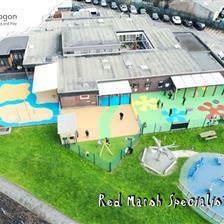 Our Co-Owner and Sales Director, Sam Flatman, was proud to have been chosen to work with the school on this amazing development to create a stimulating and inclusive outdoor space for the children. Sam went to visit the school to discuss their requirements and to inspect the site to be developed. The existing outdoor area was a plain concrete space with very little for the children to do and nothing that catered for every child’s need. Overhanging trees made the area very dark and it wasn’t an inviting area. Sam and the staff at Woodfield School worked very carefully together on a new playground design. It was very important to the school that every child had something to enjoy in the the new space, and benefit from time spent playing and learning outdoors. The school wanted to offer plenty of resources for sensory input, as well as for physical input. A lot of their pupils have difficulties with mobility, so they wanted the area to help with teaching more basic skills such as stepping, as well as other skills such as riding a bike, and learning stop-start. Selecting the right mix of appropriate safety surfacing was key. Our Wet Pour is an impact-absorbing, rubber based safety surfacing that can be used in all weathers. 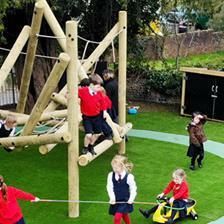 The colourful green, blue, sand and orange designs really bring the playground to life. We incorporated some exciting patterns and markings into the Wet Pour at Woodfield, including roadway markings with zebra crossings and arrows, a numbered target and a caterpillar. We installed a Timber Canopy to enable free flow play from the school’s music room. Underneath sits a wooden Perch Bench and a moveable Tuff Spot Table, which is ideal for all sorts of sensory play, construction, art and craft and messy play activities. The Canopy has made a real difference to the school. They have children who can’t move around for themselves, but who naturally want to be outdoors in all weathers. This gives them the opportunity to engage in the playground in a space where they can stay dry, protected and safe. Our fabulous Tintagel Play Tower with a bright blue slide, wooden steps, a suspension bridge and a net traverse has proved to be an absolute favourite with the children and staff alike, and has had a real physical impact. The teachers at Woodfield explained that they had a lot of children that would try to climb in places that they weren’t supposed to, and that weren’t necessarily safe to climb, but they did it because they craved the sensory input to be gained from climbing. This new climbing feature has been brilliant for them. They have had children who were previously unable to step learn very quickly, and they use it as a gross motor skill development area. A Climb Through Tunnel Hill, with a lovely soft Playturf up and over the ramp in the middle of the roadway marking, further adds to the physical play provision. It’s great for role play too as it fits in with the real world theme, and really helps to promote balance and muscle strength as children make their way around it. We offer a huge range of Active Play Equipment for nurseries, primary schools and children with special educational needs. The new Music Zone is a real “hit”, with brightly coloured African Drums and a Large Tuned Xylophone providing endless entertainment. Before our development, the children would normally search the outside area for objects to make noises with. Now that they have the appropriate tools it’s so much better for them all. We have replaced the tired old playhouse at Woodfield with a beautiful new one. It’s a big wooden Playhouse with a low entrance to make it extra cosy, and a chalkboard at the back to encourage the children to enjoy mark making, draw pictures and write their own messages. Perfect for role play as well as a special place to read a favourite book. It’s spacious enough to comfortably accommodate a wheelchair, and it offers a handy shelter for bikes and scooters when they are not in use. A variety of Sensory Panels (including a wobbly mirror which is really good fun!) and mark making boards around the area provide ideal sensory stimulation for the children. We also installed a Large Covered Sand Box for children to climb into, explore and get creative with sand. The children also have access to various chill out spaces across the environment where they can relax on Perch Benches and Mushroom Seats in funky colours. 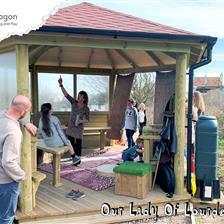 You can view our huge range of Imaginative and Creative Playground Equipment here, including Outdoor Musical Instruments, Sensory Panels and Playground Dens and Playhouses. If you are looking to create a fun and adventurous playground environment for children with special educational needs, Contact Us to speak with one of our SEN experts. You can also view our amazing range of products for children with Special educational needs here.